Watch this event on our YouTube channel here! 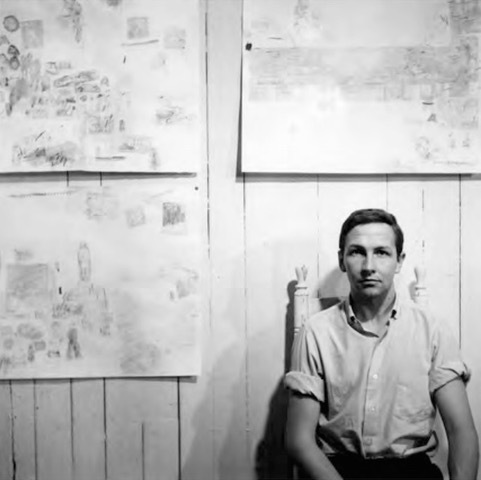 A painter, sculptor, graphic artist, and maker of hybrid forms thereof, Robert Rauschenberg is widely considered one of the most influential American artists of the 20th Century. This talk will provide an overview of the process behind, and coordination of, the oral history project conducted by INCITE/CCOHR in collaboration with the Robert Rauschenberg Foundation. This investigation sought to establish an oral biography of the artist by recording first-hand accounts of his life, work, and legacy and also to capture the spirit of the larger art world that he inhabited throughout his life. More specifically, we will focus on how our collaboration with the Robert Rauschenberg Foundation’s art historians and archivists required that we push the bounds of our practice, shaping the project’s design from preliminary research to the completed transcripts. We will present project materials to illustrate some of the innovative outcomes of the partnership between oral and art historian, including the project’s illustrated transcripts and so-called technical oral histories. Captured on film, these interviews were conducted with Rauschenberg’s studio assistants in the presence of a mini-installation of the artworks each assistant helped to create. These sessions included narrative reminiscences as well as in–depth discussions about the materials and methods used. Collaboration was also hugely important to Rauschenberg and we will share some of the stories that illuminate how it acted as an organizing principle in his life and work, as well as in this project. In addition to being the Director of the Columbia Center for Oral History Research located in INCITE, Mary Marshall Clark is co-founder and co-director of Columbia’s Oral History Master of Arts (OHMA) degree program, created in 2008-09. Clark was the co-principal investigator, with Peter Bearman, of the September 11, 2001 Oral History Narrative and Memory Project, a longitudinal oral history project through which over 1,000 hours of interviews were taken with eye-witnesses and immigrants and others – including artists - who suffered in the aftermath of the events. She also directed related projects on the aftermath of September 11th in New York City. She has directed projects on the Carnegie Corporation, the Atlantic Philanthropies, the Council on Foreign Relations, the Japanese Internment on the East Coast, the Apollo Theater and Women in the Visual Arts, a project funded by Agnes Gund. Sara Sinclair is a graduate of Columbia University’s Oral History Master of Arts program and was the project manager for CCOHR’s Robert Rauschenberg Oral History Project. Prior to attending OHMA, Sara lived in Addis Ababa, Ethiopia, where she conducted an oral history project for the International Labour Organization’s Regional Office for Africa. Sara’s work as an oral history consultant includes work for the New York City Department of Environmental Protection and the Exit Art Closure Study, a research project on the closure of New York gallery/artist’s space Exit Art (1982-2012). For Sara’s thesis at Columbia she conducted a series of interviews exploring the narratives of university-educated, reservation-raised Native North Americans on returning to their Nations after school. Sara expanded this project, ‘How We Go Home,’ through Voice of Witness’ Story Lab and is currently editing a forthcoming book with the organization. No registration is required, but RSVPs on the event Facebook page (to be posted) are appreciated to gauge attendance.